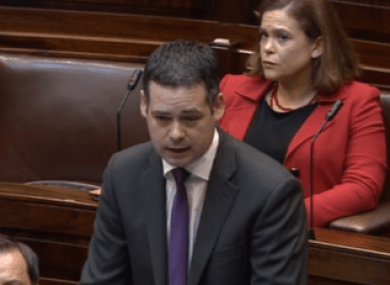 Sinn Fein TD Pearse Doherty said the Garda claims that ‘as a result of arresting a member of the drugs unit in Athlone for drunk driving that Garda management maliciously set about targeting him while the arrested Garda was afforded protection’. 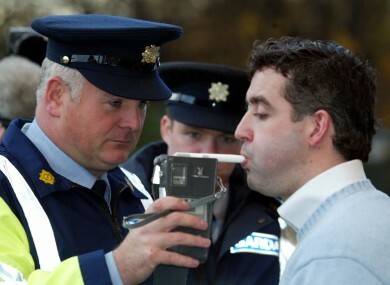 Another Garda whistleblower has come forward with allegations that he was targeted by senior management after he arrested a colleague for drink driving. Sinn Féin’s Pearse Doherty told the Dáil Garda Keith Harrison was today meeting with the interim confidential recipient. He said Garda Harrison claims that “as a result of arresting a member of the drugs unit in Athlone for drunk driving that Garda management maliciously set about targeting him while the arrested Garda was afforded protection”. Mr Doherty raised the allegations during a two-hour debate on the Guerin report into Garda malpractice in investigating 10 criminal cases. “He claims that a managerial review of his high work returns and practices was instigated and persons who had past interactions with Garda Harrison in the execution of his duties were invited by the gardaí to make complaints against him. He said Garda Harrison claimed that from September 2009 until March 2011 he was office-bound while the Garda he arrested for drink driving was still driving official vehicles and carrying an official firearm. Garda Harrison makes serious claims about how the drunk driving case was struck out of court on dubious rulings and how evidence relating to the case was stolen by the gardaí. He also claims that a Garda of officer rank, stationed in Westmeath division, prevented successful prosecution of individuals in a number of cases. Mr Doherty said he met Mr Harrison on Monday which was also attended by Garda John Wilson and Garda Nicky Keogh who had made serious claims about the connection of a major heroin dealer in the Midlands and a senior member of the drugs unit. Garda Harrison said he had suspicions about a member of the drugs unit who may have been knowingly allowing the sale of drugs in the Athlone district, but claims it “fell on deaf ears” when he raised it with management. Mr Doherty also said a civilian had come forward in recent days to corroborate claims by Garda Keogh in relation to heroin dealing and a member of the gardaí. He said Garda Harrison received an award for bravery in 2007 for a life-saving incident and he described himself in an affidavit as “once a well-respected, ambitious and unblemished member of An Garda Síochána”. But “through systematic and relentless bullying and intimidation and unmerited scrutiny I have in my view been totally undermined and destroyed. My good name and that of my family has now been tarnished and I now feel I have no option but to take this action”. He had not reported it previously because nobody would believe him above Garda management. Independent TD Mick Wallace said his office had been “snowed in” with hundreds of cases, which were “very sad to listen to”. He did not know how they would be handled but he said “something is going to have to be done”. Referring to one case he said former garda Jack Doyle, revealed in 2000 some serious drug involvement by gardaí in the Cork area. At the time the Garda authority confirmed that undercover gardaí had been involved in the importation of illegal drugs in “controlled operations” which were necessary to bring the leaders of criminal drug gangs to justice. Garda management rejected calls for an inquiry and said nothing inappropriate had occurred. He said the former garda told of how one of the drug runners told him there were many opportunities to arrest the boss of the criminal gang but failed to do so because “they have a senior Garda in their pockets”. In one incident the drug runner was in Rosslare, returning with a shipment of drugs and a customs officer stopped him and was about to stop him and search the jeep when two plainclothes gardaí commandeered the jeep and drove out of the terminal at speed, being pursued by customs officers and the gardaí “lost their pursuers”. The drug runner also spoke of leaving a handgun in a wooded area in Cork. He contacted a particular detective sergeant about the gun’s location and gardaí then added a number of firearms to “beef up the find” and the media reported it as a subversive arms find. It was done to “further their careers in the force” and one of them was now an assistant Commissioner and “could actually be the next Commissioner”. Work on ‘comprehensive’ register will begin this year to increase transparency. Over 60% of 297 charities surveyed said their fundraising had been affected by negative publicity surrounding the CRC and Rehab controversies. Work on a “comprehensive” charity register will begin in mid 2014 while charities will be required to provide financial reports from early 2015 onwards, Ireland’s designate charity regulator has said. Una Ni Dhubhghaill, the interim chief executive of the Charity Regulatory Authority, which will be formally established later this year, said her office was “part of the jigsaw” for the rebuilding of trust in the sector. She said work on an online register of charities would begin in mid-2014 and that charities with CHY number (those with a charitable tax exemption), can be expected to be contacted by the regulator by Autumn. Other charities will be approached thereafter. Ms Ni Dhubhghaill said the register, which it is hoped will be published in early 2015, would be the “core building block to this increase in transparency and accountability” at the heart of the Charities Act. Once the register is published “reporting obligations under the Charities Act will kick in for all registered charities,” she said, adding that a financial reporting framework would be developed in the interim in consultation with the charity sector. Addressing over 200 attendees at a national conference on the charity sector in Ireland Ms Ni Dhubhghaill said the online register would provide public access to “more, better and more relevant financial information” on charities. The Wheel, an umbrella organisation representing 950 charities, which organised the conference yesterday released results of an online survey showing that that 61 per cent of the 297 charities surveyed said their fundraising had been affected by negative publicity surrounding the CRC and Rehab controversies. Almost half reporting a drop in fundraising of up to 10 per cent since November 2013 while 36 per cent said they had cut back or suspended services in the past year despite an increase on demand for services. The Wheel’s chief executive Deirdre Garvey said the “acute public trust crisis” caused by the controversies had affected the whole sector at a time when they were still dealing with an impact on funding caused by the recession. Ms Garvey called for “appropriate provision” for increased funding for the charity regulator’s office next year to give effect to the phased work of the office to ensure the timely progression of its work. Similarly the director of Dóchas, Hans Zomer said the regulatory authority “needs to be resourced properly”. “The mandate of the office of the regulator is enormous…we’re talking about 8,000 charities potentially at least if not more so that it is a really big task that needs to be resourced now and in the future,” he said. In a session on transparency and accountability, Ivan Cooper, director of advocacy with the Wheel said “ultimately we need to shift from a dominant culture of privacy that has prevailed in so many dimensions of Irish life”. “The default position for a private firm is one of privacy; the default for our organisations needs to be as much transparency and openness as is possible that is commensurate with our being able to function effectively”. Mr Pat Rabbitte says it is the first step in helping families struggling with their energy bills. Energy suppliers have launched a new voluntary code to help struggling consumers stay on top of their bills. 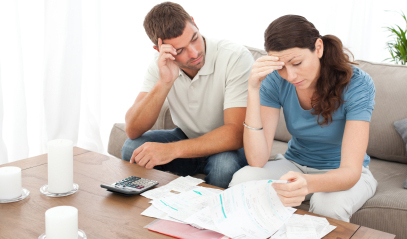 The Energy Engage Code will come into effect from June and will set out measures that suppliers will take to encourage customers in arrears, and at risk of disconnection, to engage with them to ensure they remain connected to their energy supplies. Under the code, suppliers will guarantee that no customer engaging with them will be cut off. They will also seek to identify vulnerable customers at an earlier stage and will treat each customer individually, with realistic and achievable payment plans offered to any customer who is in difficulty. The new code will be independently audited to ensure that all energy suppliers are complying. It follows months of discussions by a task force created by Pat Rabbitte, the energy minister, to examine what could be done to protect energy consumers in difficulty. While the task force was doing its work there was a complete moratorium on the disconnections for all domestic customers. The chief executive of the Electricity Association of Ireland, Owen Wilson, said that the code was a clear commitment from energy suppliers to bring arrears and disconnections “to the lowest level possible”. He said energy suppliers were already providing customers with support to manage their energy use and cut costs. “These efforts have already resulted in a significant reduction in electricity and gas disconnections. National vice-president of the St Vincent de Paul (SVP), Tom McSweeney, said the code was a welcome move when so many people were struggling to pay their bills. “Since 2008 SVP has experienced a 100% increase in calls from people in need seeking our assistance. In that time SVP energy assistance rose a staggering 200% from €3.8m to €11.3m. “It is therefore crucial that we get to the bottom of this problem,” he said. Mr Rabbitte said it was “the first step” in helping families struggling with their energy bills. Bobby Power, who was denied a life-saving cancer drug treatment by Aviva Health, with his daughter Lucy and grandchildren. AVIVA health insurance has refused to pay for a life-saving cancer drug for a father-of-four. Bobby Power (67) was scheduled to receive vital drug treatment for advanced melanoma in his liver last Monday, but the treatment was suddenly cancelled when the insurance company refused to fund it. “I’m very worried. I’m in limbo now,” said Mr Power. His oncologist told him it was “a matter of great urgency” that he receive the drug, Ipilimumab, treatment without delay. “The consultant told me it is the only drug for me,” he said. Ipilimumab is proven to give melanoma cancer patients a fighting chance against such an aggressive disease. Mr Power, who has four young grandchildren, had been a member of VHI for almost 40 years. When first diagnosed with melanoma in 2010, VHI funded the removal of part of his thumb as a means to removing the cancer. In 2012 he switched to Aviva Health after receiving assurances from Aviva that his cancer cover would be the same as the VHI. He continued to receive CAT scans at the Mater Private hospital in Dublin to monitor any recurrence of the cancer. Then last month it was back. He was diagnosed with advanced melanoma in the liver. “Everything was set up for me to get the treatment at the Mater Private on Monday but it had to be cancelled when Aviva refused to fund it,” said Mr Power, speaking at his home in Portlaw, Co Waterford. His distraught daughter, Lucy Danagher, said she pleaded with Aviva to fund the treatment. VHI and Laya Healthcare pay for Ipilimumab drug treatment for its customers, but Aviva Health refuses to pay for it, she said. Yet Aviva’s sister company in the UK covers the treatment for its British customers, she added. Ipilimumab was made available in the public health system by Health Minister James Reilly in 2012. A spokesperson for Aviva Ireland said:“Because we are bound by the terms of the data protection legislation, we are not at liberty to discuss with any third party the detail of our conversations and our contracts with any of our customers. “We would, however, point out that the HSE did not take the decision to cover Ipilimumab until May 5, 2012, and VHI announced its decision to cover the drug on August 17 2012. “Aviva consults the National Centre for Pharmaeconomics (NCPE) as independent advisors for health technology assessments on all new drugs. The approximate price for Ipilimumab is over €100,000 per four-week treatment. If the price quoted to Aviva by the drug manufacturer were to fall in line with the NCPE advice, Aviva would review its position, the spokesperson said. The California family whose surveillance video captured Tara’s heroism landed on NBC’s “Today” show Thursday morning. If you somehow haven’t seen the amazing footage of Tara warding off a vicious attack on a 4-year-old boy by a neighbor’s dog, it’s worth a few minutes of your time. Jeremy Triantafilo was riding his bicycle in front of his family’s Bakersfield home when a neighbor’s dog — a Labrador-Chow mix — came around a parked car, grabbed Jeremy’s leg and violently dragged the boy from the bike. Before Jeremy’s mother could even respond to her son’s screams, the family’s house cat, Tara, came running to the rescue and chased the dog away. “It was pretty amazing to see just a cat take on a dog and so selflessly just put herself out there and not worry about if she was going to get bit or injured herself, and … I think that dog just really did not even know what hit him,” added Jeremy’s dad, Roger Triantafilo. Savannah Guthrie: You guys have had this cat for about six years now, had you ever seen this side of her personality? I mean, does she have a lion complex? Erica Triantafilo: Every once in a while she puts our dog back into her place, but for the most part she’s just the most mellow cat you’ve ever met. Jeremy had to get stitches, but the family told “Today” that he’s doing well and resting up (he caught up on some sleep during the NBC interview as well). The cat meowed her way through the initial part of the interview and ditched the family about halfway through the Q&A. As for the dog, he is in quarantine. The owners can rehabilitate him; failing which, he will be put to sleep, Erica Triantafilo said on the show. During the early Miocene, the cave where the fossils were found was surrounded by a dense rainforest. Many bats used the cave, which was also a trap for forest animals that tumbled over its edge. There was a pool of water in the entrance chamber where the ostracods thrived. Bat poo may have preserved the world’s oldest sperm, which has been found at a fossil site in Australia, say researchers. 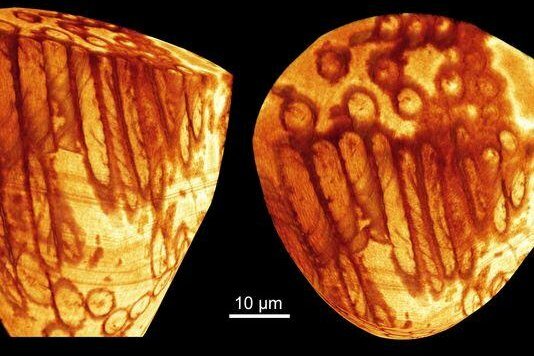 The discovery of giant sperm along with other internal reproductive organs in exceptionally well-preserved 17-million year old fossil “seed shrimp” or ostracods is reported this week in the Proceedings of the Royal Society B. “They’re cute little guys. They have two little shells and if you look inside, it looks like a little crab tucked up inside desperate to avoid being seen by the rest of the world,” says Archer. He and colleagues found male and female ostracods fossilised in deposits at the Bitesantennary Site in the Riversleigh World Heritage area of the Australian state of Queensland. “There were zillions of bat bones so we know there were bats,” he says. He says this conclusion is supported by a chemical analysis of the rock from the cave which shows it is filled with phosphorus. “And it happened so fast that soft tissues apparently were preserved,” he says. Associate Professor Suzanne Hand says the bats’ likely role in the preservation of ostracod sperm cells is doubly interesting. Using synchrotron x-ray tomography and a new high resolution nanotomography procedure, team members in Europe got a full view of the ostracods’ internal reproductive organs. “Suddenly every aspect of the ostracod could be seen,” says Archer. 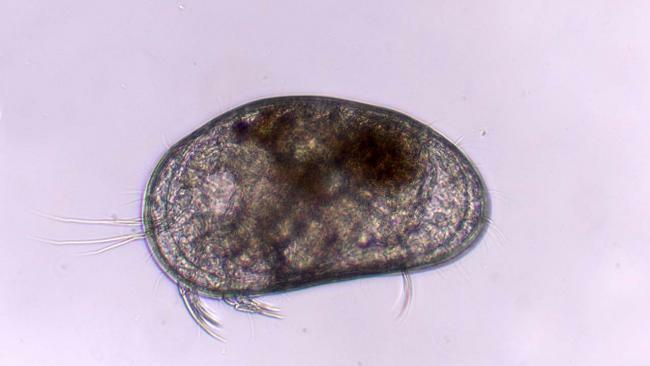 While ostracods are just a few millimetres long, their elaborate reproductive system accounts for one-third of the mature adult’s volume. “These guys were actively in a state of reproduction. They were going about it and then suddenly tables turned and all of a sudden all biological activity stopped and they were sent into the future as a time capsule just doing what they were doing,” says Archer. “We’ve never seen the intracellular structures preserved before. It’s the nature of this preservation that has boggled everybody’s mind,” says Archer. “This suggests that their mode of reproduction represents a functionally successful model,” says co-author Dr Renate Matzke-Karasz of Ludwig-Maximillian-University and Geo-Bio-Center in Munich.